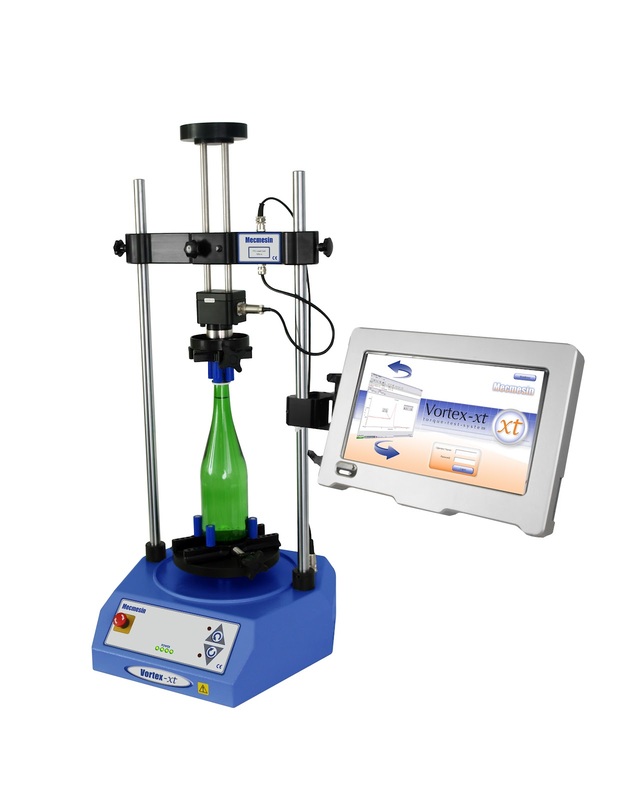 Torque testing of PET bottle closures is performed to identify the torque required to open a closed cap. Systematic testing informs line managers that their capping machines are applying sufficient torque to produce the necessary degree of seal - but not excessive torque, which would make opening difficult. 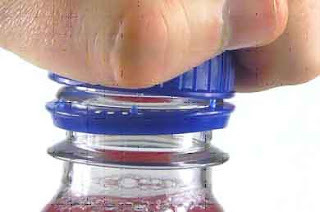 Following slip (initial break) torque, the cap's bridges do not break and the cap spins around the thread but is not separable from the bottle, resulting in a bottle whose cap is unscrewed but still attached. When closure torque is applied, the lid or cap does not bind to the thread and come to rest creating a tight seal, but continues to travel. The cap spins around the thread and returns to its state prior to tightening. Subsequent tightening results in the same. Testing closure torque alerts managers to such problems, saving costs resulting from waste, downtime, and returns. An acceptable torque range is defined by registering minimum and maximum torque values (1 and 1.5 N, for example) on the Orbis. For enclosure opening tests, counter clockwise is specified (clockwise if measuring tightening torque). The user places the bottle on the platen, then winds in the pegs to grip it securely. This prevents the bottle rather than the cap rotating when torque is applied. The user zeros the display to cancel any torque detected during placement of the bottle, and then twists the cap in a counter-clockwise direction as if opening the bottle normally. The Orbis detects the peak torque and reports this as the torque required to open the container. If this reading is between the minimum and maximum, the sample passes. If the torque required to open the container is outside the specified range (i.e. above the maximum or below the minimum), the sample fails. The torque reading will reveal if insufficient or excessive torque was applied by the capping machines. If several samples fail, a production line supervisor would call a technician to increase or decrease the torque exerted by the capping machines. The Tornado torque tester is capable of all the functions of the Orbis, but has an additional, vital function: tamper evident testing. Tamper-evident closures are a standard quality feature of beverage bottles and containers of other liquids that would degrade if adulterated or exposed. Tamper-evident closures consist of two parts - a cap and a band, which are connected by a “bridge” of regularly spaced, fine plastic tags. The content of a bottle that is capped with a tamper-evident closure can be accessed only if the cap is fully rotated counter clockwise (i.e. opened). This rotation will snap the bridge, resulting in separation of cap from band. A broken bridge provides visible evidence of prior opening or tampering. To measure the torque required to breach a tamper-evident closure, the Tornado takes two peak torque readings: “slip torque”, which is the first and normally higher reading, and “bridge torque”, which is the second, normally lower reading. Slip torque identifies the torque required to initiate rotation of the cap around the thread of the bottle. Bridge torque identifies the torque required to initiate rupturing of the bridge. The Tornado can be easily configured to report these two torque readings. The bottle is placed on the platen and the user winds in the pegs to grip the bottle securely. To cancel any torque reading resulting from bottle placement, the user zeros (resets) the Tornado. The user then twists the cap and continues rotating it until the bridge is broken. The first and second peak torques appear on the Tornado’s display and identify slip and bridge torque respectively. The tamper-evident test reveals whether or not the cap can be removed and the bridge broken using pre-specified torque. 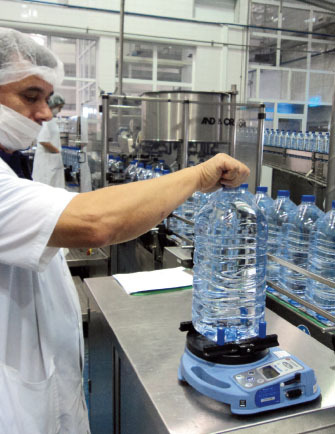 Testing slip and bridge torque informs the bottlers that their product is leaving the production line properly sealed for integrity and consumer safety. A Vortex-xt (pictured) motorized tester can provide much more sophisticated torque testing of container lids and caps. 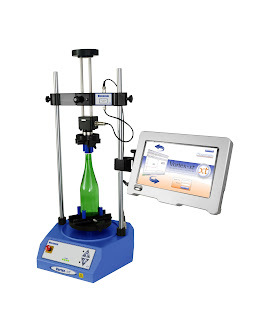 The Vortex-xt can output torque data in realtime to its touchscreen display/interface (Vortex-xt) or to a computer, where data can be displayed as a graph. Data and tests can be stored on the touchscreen or a computer for future retrieval. Test results can be overlaid for purposes of comparison. The grips and motorized rotation provide far greater sample stability and uniformity of torque, creating higher accuracy of results and reducing the influence of the variables that occur with manual, handheld testing.